May 13, 2017: Fifty years ago today, a false Soviet warning of large-scale Israeli troop concentrations along the border with Syria touched off a chain of events leading to the 1967 Six-Day War. However, as Middle East Quarterly editor Efraim Karsh explains in this advance-release article from the Summer 2017 issue of Middle East Quarterly, another all-out Arab-Israeli war was already "a foregone conclusion." May 22, 1967. 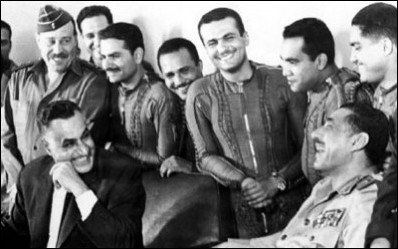 Nasser (left, 1st row) joins Egyptian air force pilots at Bir Gifgafa base before the Six-Day War. The total Arab rejection of Jewish statehood made an all-out Arab-Israeli war a foregone conclusion. 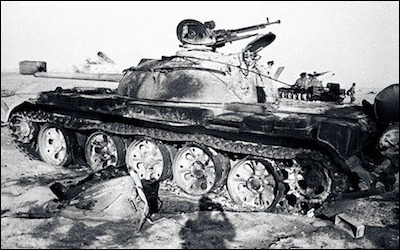 It has long been conventional wisdom to view the June 1967 war as an accidental conflagration that neither Arabs nor Israelis desired, yet none were able to prevent. Had Egyptian president Gamal Abdel Nasser not fallen for a false Soviet warning of Israeli troop concentrations along the Syrian border and deployed his forces in the Sinai Peninsula, the standard narrative runs, the slippery slope to war would have been averted altogether; had Israel not misconstrued the Egyptian grandstanding for a mortal threat to its national security, if not its very survival, it would have foregone the preemptive strike that started the war. In short, it was a largely accidental and unnecessary war born of mutual miscalculations and misunderstandings. This view could not be further from the truth. If wars are much like road accidents, as the British historian A.J.P. Taylor famously quipped, having a general cause and particular causes at the same time, then the June 1967 war was anything but accidental. Its specific timing resulted of course from the convergence of a number of particular causes at a particular juncture. But its general cause—the total Arab rejection of Jewish statehood, starkly demonstrated by the concerted attempt to destroy the state of Israel at birth and the unwavering determination to rectify this "unfinished business"—made another all-out Arab-Israeli war a foregone conclusion. Pan-Arab nationalists carried out a pogrom in Jerusalem in 1920, killing five Jews and wounding 211. 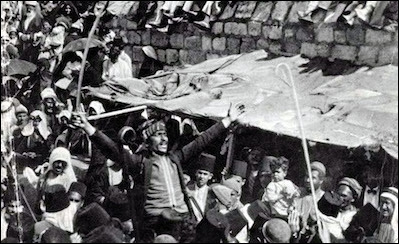 In 1921, Arab riots claimed 90 dead with hundreds wounded. In 1929, more violence resulted in the death of 133 Jews and the wounding of hundreds more. No sooner had the doctrine of pan-Arabism, postulating the existence of "a single nation bound by the common ties of language, religion and history.... behind the facade of a multiplicity of sovereign states" come to dominate inter-Arab politics at the end of World War I than anti-Zionism became its most effective rallying cry: not from concern for the wellbeing of the Palestinian Arabs but from the desire to fend off a supposed foreign encroachment on the perceived pan-Arab patrimony. For me, you may be a fact, but for [the Arab masses], you are not a fact at all—you are a temporary phenomenon. Centuries ago, the Crusaders established themselves in our midst against our will, and in 200 years, we ejected them. This was because we never made the mistake of accepting them as a fact. On rare occasions, this outright rejectionism was manifested in quiet attempts to persuade the Zionist leaders to forego their quest for statehood and acquiesce in subject status within a regional pan-Arab empire. Nuri Said, a long-time Iraqi prime minister, made this suggestion at a 1936 meeting with Chaim Weizmann while Transjordan's King Abdullah of the Hashemite family secretly extended an offer to Golda Meir (in November 1947 and May 1948) to incorporate Palestine's Jewish community into the "Greater Syrian" empire he was striving to create at the time. For most of the time, however, the Arabs' primary instrument for opposing Jewish national aspirations was violence, and what determined their politics and diplomacy was the relative success or failure of that instrument in any given period. As early as April 1920, pan-Arab nationalists sought to rally support for incorporating Palestine into the short-lived Syrian kingdom headed by Abdullah's brother, Faisal, by carrying out a pogrom in Jerusalem in which five Jews were murdered and 211 wounded. The following year, Arab riots claimed a far higher toll: some 90 dead and hundreds wounded. In the summer of 1929, another wave of violence resulted in the death of 133 Jews and the wounding of hundreds more. For quite some time, this violent approach seemed to work. It was especially effective in influencing the British, who had been appointed the mandatory power in Palestine by the League of Nations. Though their explicit purpose was to facilitate the establishment of a Jewish national home in Palestine, the British authorities repeatedly gave in to Arab violence aimed at averting that purpose and to the demands that followed upon it. In two White Papers, issued in 1922 and 1930 respectively, London severely compromised the prospective Jewish national home by imposing harsh restrictions on immigration and land sales to Jews. In May 1939, a White Paper imposed restrictions, closing the door to Palestine for Jews desperate to flee Nazi Europe. In July 1937, Arab violence reaped its greatest reward when a British commission of inquiry, headed by Lord Peel, recommended repudiating the terms of the mandate altogether in favor of partitioning Palestine into two states: a large Arab state, united with Transjordan, that would occupy some 90 percent of the mandate territory, and a Jewish state in what was left. This was followed in May 1939 by another White Paper that imposed even more draconian restrictions on Jewish immigration and land purchases, closing the door to Palestine for Jews desperate to flee Nazi Europe and threatening the survival of the Jewish national project. Agitating for more, the Arabs dismissed both plans as insufficient. They did the same in November 1947 when, in the face of the imminent expiration of the British mandate, the U.N. General Assembly voted to partition Palestine. Rejecting this solution, the Arab nations resolved instead to destroy the state of Israel at birth and gain the whole for themselves. This time, however, Arab violence backfired spectacularly. In the 1948-49 war, not only did Israel confirm its sovereign independence and assert control over somewhat wider territories than those assigned to it by the U.N. partition resolution, but the Palestinian Arab community was profoundly shattered with about half of its population fleeing to other parts of Palestine and to neighboring Arab states. Preparing for the "Second Round"
For the next two decades, inter-Arab politics would be driven by the determination to undo the consequences of the 1948 defeat, duly dubbed "al-Nakba," the catastrophe, and to bring about Israel's demise. Only now, it was Cairo rather than the two Hashemite kings that spearheaded the pan-Arab campaign following Nasser's rise to power in 1954 and his embarkation on an aggressive pan-Arab policy. The Egyptian president had nothing but contempt for most members of the "Arab Nation" he sought to unify: "Iraqis are savage, the Lebanese venal and morally degenerate, the Saudis dirty, the Yemenis hopelessly backward and stupid, and the Syrians irresponsible, unreliable and treacherous," he told one of his confidants. Neither did he have a genuine interest in the Palestinian problem—pan-Arabism's most celebrated cause: "The Palestinians are useful to the Arab states as they are," he told a Western journalist in 1956. "We will always see that they do not become too powerful. Can you imagine yet another nation on the shores of the eastern Mediterranean!" Yet having recognized the immense value of this cause for his grandiose ambitions, he endorsed it with a vengeance, especially after the early 1960s when his pan-Arab dreams were in tatters as Syria acrimoniously seceded from its bilateral union with Egypt (1958-61) and the Egyptian army bogged down in an unwinnable civil war in Yemen. "Arab unity or the unity of the Arab action or the unity of the Arab goal is our way to the restoration of Palestine and the restoration of the rights of the people of Palestine," Nasser argued. "Our path to Palestine will not be covered with a red carpet or with yellow sand. Our path to Palestine will be covered with blood." 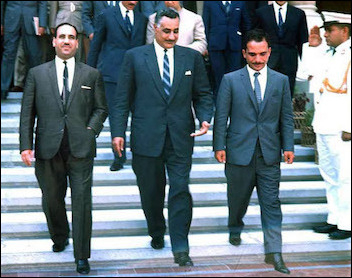 (Left to right) Abdel Salam Aref of Iraq, Gamal Abdel Nasser of Egypt, and King Hussein of Jordan arrive in Alexandria for an Arab summit, October 1964. By way of transforming this militant rhetoric into concrete plans, in January 1964, the Egyptian president convened the first all-Arab summit in Cairo to discuss ways and means to confront the "Israeli threat." A prominent item on the agenda was the adoption of a joint strategy to prevent Israel from using the Jordan River waters to irrigate the barren Negev desert in the south of the country. A no less important decision was to "lay the proper foundations for organizing the Palestinian people and enabling it to fulfill its role in the liberation of its homeland and its self-determination." Four months later, a gathering of 422 Palestinian activists in East Jerusalem, then under Jordanian rule, established the Palestine Liberation Organization (PLO) and approved its two founding documents: the organization's basic constitution and the Palestinian National Covenant. These events made Nasser yet again the undisputed leader of the Arab world, the only person capable of making the Arabs transcend, however temporarily, their self-serving interests for the sake of the collective good. He was nowhere near his cherished goal of promoting the actual unification of the Arab world under his leadership as he had seemingly been in 1958 when Syria agreed to merge with Egypt. Yet he had successfully hijacked pan-Arabism's most celebrated cause and established a working relationship with his erstwhile enemies in Amman and Riyadh. In a second summit meeting in Alexandria in October 1964, the heads of the Arab states accepted Nasser's long-term, anti-Israel strategy. This envisaged the laying of the groundwork for the decisive confrontation through the patient buildup of Arab might in all areas—military, economic, social, and political—and the simultaneous weakening of Israel through concrete actions such as the diversion of the Jordan River estuaries. The PLO was authorized to create an army of Palestinian volunteers, to which the Arab governments pledged to give support, and a special fund was established for the reorganization of the Lebanese, Syrian, and Jordanian armies under a united Arab command. Before long, this organized pan-Arab drive for Israel's destruction was disrupted by an unexpected sequence of events that led, within a few weeks, to the third Arab-Israeli war since 1948; and the event that triggered this escalation was a Soviet warning (in early May 1967) of large-scale Israeli troop concentrations along the border with Syria aimed at launching an immediate attack. As pan-Arabism's standard-bearer, Nasser had no choice but to come to the rescue of a (supposedly) threatened ally tied to Egypt in a bilateral defense treaty since November 1966, especially when the pro-Western regimes in Jordan and Saudi Arabia were openly ridiculing his failure to live up to his high pan-Arab rhetoric. Egyptian tank, Sinai Peninsula, 1967. On May 14, Egypt moved two armored divisions into the Sinai Peninsula, formally demilitarized since the 1956 Suez war. Three days after the start of the war, their army was crushed and expelled from Sinai. From that point onward, I began to believe that the issue of Israeli concentrations along the Syrian border was not ... the only or the main cause of the military deployments which Egypt was undertaking with such haste. Within less than twenty-four hours, Nasser's objective had been transformed from the deterrence of an Israeli attack against Syria into an outright challenge to the status quo established after the 1956 war. 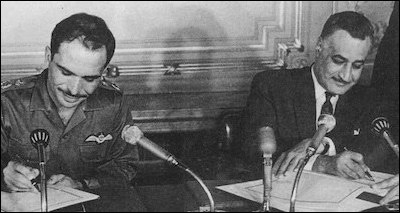 With Fawzi's reassuring findings corroborated both by Egyptian military intelligence and by a special U.N. inspection, and the Israelis going out of their way to reassure the Soviets that they had not deployed militarily along their northern border, Nasser must have realized that there was no imminent threat to Syria. He could have halted his troops at that point and claimed a political victory, having deterred an (alleged) Israeli attack against Syria. Egyptian Lt.-Gen. Fawzi found no trace of Israeli concentrations along the Syrian border or troop movements in northern Israel. But it is precisely here that the Arab-Israeli conflict's general cause—rejection of Israel's very existence—combined with the particular causes to make war inevitable as Nasser's resolute move catapulted him yet again to a position of regional preeminence that he was loath to relinquish. At a stroke, he had managed to undo one of Israel's foremost gains in the 1956 war—the de facto demilitarization of the Sinai Peninsula—without drawing a serious response from Jerusalem. Now that the Egyptian troops were massing in Sinai, Nasser decided to raise the ante and eliminate another humiliating remnant of that war for which he had repeatedly been castigated by his rivals in the Arab world: the presence of a U.N. Emergency Force (UNEF) on Egyptian (but not on Israeli) territory as a buffer between the two states. As the U.N. observers were quickly withdrawn and replaced by Egyptian forces, Nasser escalated his activities still further. Addressing Egyptian pilots in Sinai on May 22, he announced the closure of the Strait of Tiran, at the southern mouth of the Gulf of Aqaba, to Israeli and Israel-bound shipping. "The Gulf of Aqaba constitutes our Egyptian territorial waters," he announced to the cheers of an ecstatic audience. "Under no circumstances will we allow the Israeli flag to pass through the Aqaba Gulf." The following day the Egyptian mass media broke the news to the entire world. Nasser announced the closure of the Strait of Tiran to Israeli and Israel-bound shipping. 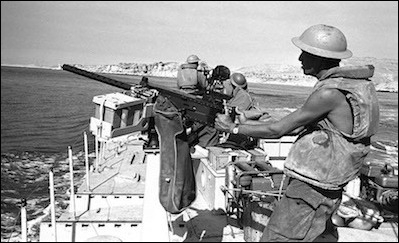 Within days of the start of the war, Israeli gunboats passed freely through the straits. Did Nasser consider the possibility that his actions might lead to war? All the available evidence suggests that he did. Initially, when he briefly believed in the imminence of an Israeli attack against Syria, he could not have taken for granted that the Egyptian deployment in Sinai would have deterred such an action, in which case he would have been forced to come to Syria's defense. Moreover, the demilitarization of Sinai was seen by Israel as vital to its national security, which made its violation a legitimate casus belli. But then, Nasser was being rapidly entrapped by his imperialist ambitions. He began deploying his troops in Sinai out of fear that failure to do so would damage his pan-Arab position beyond repair. He continued to escalate his activities, knowing full well that there was no threat of an Israeli attack against Syria, because of his conviction that the continuation of the crisis boosted his pan-Arab standing. When Nasser asked us our opinion, we were all agreed that the Strait should be closed—except for [Prime Minister] Sidqi Sulayman, who pleaded with Nasser to show more patience ... [But] Nasser paid no attention to Sulayman's objections. He was eager to close the Strait so as to put an end to the Arab maneuverings and maintain his great prestige within the Arab world. Egyptian war preparations were carried out in front of the watching eyes of the world media. The die was cast. Having maneuvered himself yet again into the driver's seat of inter-Arab politics, Nasser could not climb down without risking a tremendous loss of face. He was approaching the brink with open eyes, and if there was no way out of the crisis other than war, so be it: Egypt was prepared. Daily consultations between the political and the military leaderships were held. The Egyptian forces in Sinai were assigned their operational tasks. In a widely publicized article in al-Ahram on May 26, the newspaper's editor-in-chief, Nasser's mouthpiece, Muhammad Hassanein Heikal, explained why war between Egypt and Israel was inevitable. A week later, at a meeting with the armed forces' supreme command, Nasser predicted an Israeli strike against Egypt within forty-eight to seventy-two hours at the latest. The coming of war is seldom a happy occasion. It is often fraught with misgivings and apprehensions. But if doubts assailed Nasser's peace of mind, he gave them no public expression. The Egyptian war preparations were carried out in a confident and ever-extravagant fashion, in front of the watching eyes of the world media. The closer Nasser came to the brink, the more aggressive he became. "The Jews have threatened war," he gloated in his May 22 speech, "We tell them: You are welcome; we are ready for war." Four days later, he took a big step forward, announcing that if hostilities were to break out, "our main objective will be the destruction of Israel." "Now that we have the situation as it was before 1956," Nasser proclaimed on another occasion, "Allah will certainly help us to restore the status quo of before 1948." When Nasser held his famous press conference, before the June 1967 war, and spoke with confident pomp, I took our victory over Israel for granted. I envisaged it as a simple journey to Tel Aviv, of hours or days at the most, since I was convinced we were the greatest military power in the Middle East. By this time, the conflict was no longer about the presence of U.N. forces on Egyptian soil or freedom of navigation in the Gulf of Aqaba, let alone the alleged Israeli threat to Syria. It had been transformed into a jihad to eradicate the foremost "remnant of Western imperialism" in the Middle East. "During the crusaders' occupation, the Arabs waited seventy years before a suitable opportunity arose, and they drove away the crusaders," Nasser echoed Azzam's 1947 rhetoric, styling himself as the new Saladin: "[R]ecently we felt that we are strong enough, that if we were to enter a battle with Israel, with God's help, we could triumph." Nasser's former Arab rivals were standing in line to rally behind Egypt. On May 30, Jordan's King Hussein (left) arrived in Cairo where he immediately signed a defense pact with Egypt. Nasser's militancy was contagious. The irritating chorus of criticism had fallen silent. His former Arab rivals were standing in line to rally behind his banner. On the morning of May 30, Jordan's King Hussein, who at the beginning of the crisis still mocked Nasser for "hiding behind UNEF's apron," arrived in Cairo where he immediately signed a defense pact with Egypt. He returned to Amman later that day accompanied by Ahmad Shuqeiri, head of the PLO and hitherto one of the king's archenemies. The following day, an Egyptian general arrived in Amman to command the eastern front in the event of war. On June 4, Iraq followed suit by entering into a defense agreement with Egypt, and Nasser informed King Hussein that their pact now included Iraq as well. By this time, Arab expeditionary forces—including an Iraqi armored division, a Saudi and a Syrian brigade, and two Egyptian commando battalions—were making their way to Jordan. The balance of forces, so it seemed to the Arabs, had irreversibly shifted in their favor. The moment of reckoning with the "Zionist entity," as they pejoratively called Israel, had come. "Have your authorities considered all the factors involved and the consequences of the withdrawal of UNEF?" the commander of the U.N. force, Gen. Indar Jit Rikhye, asked the Egyptian officers bearing the official demand. "Oh yes sir! We have arrived at this decision after much deliberation, and we are prepared for anything. If there is war, we shall next meet at Tel Aviv." The Iraqi president Abdel Rahman Aref was no less forthright. "This is the day of the battle," he told the Iraqi forces leaving for Jordan. "We are determined and united to achieve our clear aim—to remove Israel from the map. We shall, Allah willing, meet in Tel Aviv and Haifa." Yet for all his militant zeal, Nasser had weighty reasons to forgo a first strike at this particular time. His war preparations had not been completed: The Egyptian forces in Sinai were still digging in; the Arab expeditionary forces to Jordan had not yet been fully deployed, and coordination of the operational plans of the Arab military coalition required more time. Nasser also feared that an Egyptian attack would trigger a U.S. military response that might neutralize the new Arab political and military superiority over Israel, which had been gained by the most remarkable demonstration of pan-Arab unity since the 1948 war. Nasser believed the Egyptian air force might only incur a small loss before dealing a devastating blow to Israel. Nasser's fears of U.S. intervention were compounded by the nature of the Egyptian operational plan, which envisaged deep thrusts into Israel's territory. An armored division was to break out of the Gaza Strip and capture border villages inside Israel while another armored division was to cut off the southern Negev from the rest of Israel, thereby achieving the long-standing Egyptian objective of establishing a land bridge with Jordan. Given Nasser's belief in the U.S. commitment to Israel's territorial integrity, such plans could hardly be implemented if Egypt were to take the military initiative. Their execution as an act of self-defense in response to an Israeli attack was a completely different matter, however. This explains Nasser's readiness to play the political card, such as his decision to send Vice-President Zakaria Muhieddin to Washington on June 7. He had no intention whatever to give ground, and the move was aimed at cornering Israel and making it more vulnerable to Arab pressure and, eventually, war. Robert Anderson, a special U.S. envoy sent to Egypt to defuse the crisis, reported to President Lyndon Johnson that Nasser showed no sign of backing down and spoke confidently of the outcome of a conflict with Israel. Anderson was not the only person to have heard this upbeat assessment. Nasser's belief in Egypt's ability to absorb an Israeli strike and still win the war was widely shared by the Egyptian military and was readily expressed to the other members of the Arab military coalition. In his May 30 visit to Cairo, King Hussein was assured by Nasser of Egypt's full preparedness against an Israeli air strike: No more than 15-20 percent losses would be incurred before the Egyptian air force dealt a devastating blow to Israel. The other members of the Jordanian delegation heard equally confident words from Abdel Hakim Amer, Nasser's deputy and commander of the Egyptian armed forces. When the Egyptian foreign minister Mahmoud Riad asked Amer about the armed forces' state of readiness, he was told that "if Israel actually carried out any military action against us, I could, with only one third of our forces, reach Beersheba." Israel has no alternative but to use arms if it wants to exercise power. This means that the logic of the fearful confrontation now taking place between Egypt, fortified by the might of the masses of the Arab nation, and Israel, bolstered by the illusion of American might, dictates that Egypt, after all it has now succeeded in achieving, must wait, even though it has to wait for a blow. This is necessitated also by the sound conduct of the battle, particularly from an international point of view. Let Israel begin. Let our second blow then be ready. Let it be a knockout. The Egyptians saw their air force destroyed on the ground within three hours of the outbreak of hostilities. As it were, the war that broke out on June 5 was not quite the knockout that Heikal had in mind. 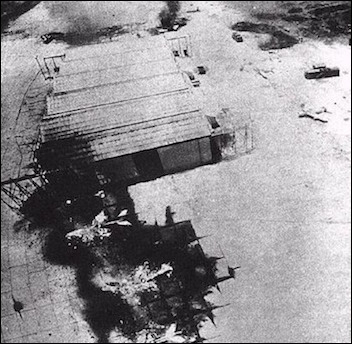 Instead of dealing Israel a mortal blow, the Egyptians saw their air force destroyed on the ground within three hours of the outbreak of hostilities and their army crushed and expelled from Sinai over the next three days. As Syria, Jordan, and Iraq attacked Israel, their armies were similarly routed. By the time the war was over, after merely six days of fighting, Israel had extended its control over vast Arab territories about five times its own size, from the Suez Canal, to the Jordan River, to the Golan Heights. retired members of the old Revolutionary Command Council wander in and out of meetings and give their opinions; Nasser butts in and nobody pays much attention to him; he takes journalists seriously and revises his intelligence estimate on the basis of their remarks; he is influenced by the casual conversation of diplomats. Aside from doing a great injustice to Nasser—the charismatic dictator who had heavy-handedly ruled Egypt for over a decade and mesmerized tens of millions throughout the Arabic-speaking world—this description has little basis in reality. As evidenced both by Nasser's escalatory behavior during the crisis and by captured military documents revealing elaborate plans for an invasion of Israel, the Egyptian president did not stumble into war but orchestrated it with open eyes. He steadily raised his sights in accordance with the vicissitudes in the crisis until he set them on the ultimate pan-Arab objective: the decisive defeat of Israel and, if possible, its destruction. The June 1967 war was a direct corollary of pan-Arabism's delusions of grandeur, triggered by the foremost champion of this ideology and directed against its foremost nemesis. It was the second all-out attempt in a generation to abort the Jewish national revival, and it ended in an even greater ignominy than its 1948 precursor. Then, only half of Palestine had been lost. Now the land was lost in its entirety, together with Egyptian and Syrian territories. In 1948, the dividing line between victor and vanquished was often blurred as the war dragged on intermittently for over a year. In 1967, owing to the war's swift and decisive nature, there was no doubt as to which side was the victor. The magnitude of the defeat thus punctured the pan-Arab bubble of denial and suggested to the Arabs that military force had its limits. If the 1967 war was fought with a view to destroying Israel, the next war, in October 1973, launched by Nasser's successor Anwar Sadat, had the far narrower objective of triggering a political process that would allow Egypt to regain the territories lost in 1967. Israel's remarkable military recovery in October 1973 after having been caught off-guard further reinforced Sadat's determination to abandon pan-Arabism's most celebrated cause and culminated in the Egyptian-Israeli peace treaty of March 1979. While one can only speculate about Sadat's ultimate intentions (he was assassinated in October 1981 by an Islamist zealot), there is little doubt that his successor, Hosni Mubarak, viewed peace not as a value in and of itself but as the price Egypt had to pay for such substantial benefits as increased U.S. economic and military aid. So did the Palestine Liberation Organization (PLO), which perceived its 1990s peace agreements with Israel as a pathway not to a two-state solution—Israel alongside a Palestinian state in the West Bank and Gaza living side-by- side in peace—but to the subversion of the state of Israel. In Arab eyes, then, with the partial exception perhaps of Jordan's King Hussein, contractual peace with Israel has represented not a recognition of legitimacy but a tacit admission that, at least for the time being, the Jewish state cannot be defeated by force of arms. And while militant pan-Arabism is unlikely to regain its pre-1967 dominance in the foreseeable future due to the ravages of the recent Arab upheavals, the advent of a new generation of Palestinians and Arabs for whom the 1967 defeat is but a dim memory, one more historical injustice that has to be redressed by any means necessary, makes the prospects of Arab-Israeli reconciliation as remote as ever. Efraim Karsh, editor of the Middle East Quarterly, is emeritus professor of Middle East and Mediterranean studies at King's College London and professor of political studies at Bar-Ilan University where he also directs the Begin-Sadat Center for Strategic Studies. See, for example, Charles W. Yost, "How the Arab-Israeli War Began," Foreign Affairs, Jan. 1968, p. 317; Ernest C. Dawn, "The Egyptian Remilitarization of Sinai," Journal of Contemporary History, July 1968, p. 213; Maxime Rodinson, Israel and the Arabs (Harmondsworth: Penguin, 1968), pp. 198-200; Richard B. Parker, The Politics of Miscalculation in the Middle East (Bloomington: Indiana University Press, 1993), pp. 97-8; Avi Shlaim, The Iron Wall: Israel and the Arab World (New York: Norton, 2001), pp. 236-7; Michael Oren, "Making Sense of the Six Day War," MEF Wires, May 6, 2002. A.S. Eban to the Executive of the Jewish Agency, "Conversation with Abdul Rahman Azzam, 15th September 1947," Sept. 29, 1947, Zionist Archives (Jerusalem), S25/9020; David Horowitz, State in the Making (New York: Knopf, 1953), pp. 231-5. Norman A. Rose, ed., Baffy. The Diaries of Blanche Dugdale, 1936-1947 (London: Vallentine, Mitchell, 1973), p. 23 (June 29, 1936 entry); Chaim Weizmann to Sir Archibald Clark-Kerr, Baghdad, June 29, 1936, Chaim Weizmann to William G.A. Ormsby-Gore, London, June 28, 1936, The Letters and Papers of Chaim Weizmann. Series A, Vol. 17, Aug. 1935-Dec. 1936 (New Brunswick and Jerusalem: Transaction Books and Israel Universities Press, 1979), pp. 290-2; Ezra Danin, "Conversation with Abdullah, 17.11.47," Zionist Archives, S25/4004; Sasson to Shertok, Nov. 20, 1947, Zionist Archives, S25/1699; Golda Meyerson's oral report to the Provisional State Council, May 12, 1948, Israel State Archives, Provisional State Council: Protocols, 18 April-13 May 1948 (Jerusalem: Israel Government Publishing House, 1978), pp. 40-1. Report. Presented to the Secretary of State for the Colonies in Parliament by Command of his Majesty, July 1937, Palestine Royal Commission (London: Her Majesty's Stationery Office; rep. 1946), pp. 296-7. "Cmd. 6019: Palestine, Statement of Policy," May 1939, Her Majesty's Stationery Office, London, 1939. Nejla Izzedin, Nasser of the Arabs: An Arab Assessment (London: Third World Centre, 1981), p. 327; Miles Copeland, The Games of Nations (London: Weidenfeld and Nicolson, 1970), pp. 56-7. "President Gamal Abdel Nasser's Pre-Election Speeches in Asiut, Minia, Shebin el Kom, Mansura," Information Ministry, Cairo, 1965, pp. 28-9, 68. Ahmad Shuqeiry, Min al-Qimma ila-l-Hazima (Beirut: Dar al-Awda, 1971), p. 50; Yezid Sayigh, Armed Struggle and the Search for State: The Palestinian National Movement, 1949-1993 (Washington, D.C. and London: Institute for Palestine Studies and Clarendon Press, 1997), p. 98. Anwar Sadat, In Search of Identity: An Autobiography (New York: Harper and Row, 1978), pp. 171-2; al-Ahram (Cairo), May 23, 1967. Muhammad Fawzi, Harb ath-Thalath Sanawat, 1967-1970 (Cairo: Dar al-Mustaqbal al-Arabi, 1980), pp. 71-2. Abdel Muhsin Kamel Murtagi, al-Fariq Murtagi Yarwi al-Haqa'iq: Qaid Jabhat Sinai fi Harb 1967 (Cairo: Dar al-Watan al-Arabi, 1976), p. 64; Indar Jit Rikhye, The Sinai Blunder (London: Cass, 1980), pp. 11-2. On three occasions the Soviet ambassador to Israel was invited by the Israeli authorities to visit the border area but declined to go. Sydney D. Bailey, Four Arab-Israeli Wars and the Peace Process (London: Macmillan, 1990), p. 190. Sadat, In Search of Identity, p. 172. Sadat's version was confirmed by Zakaria Muhieddin, second vice-president in 1967, who also participated at the meeting. See Muhammad Hassanein Heikal, 1967: al-Infijar (Cairo: al-Ahram, 1990), pp. 514-9; Richard B. Parker, "The June War: Some Mysteries Explored," Middle East Journal, Spring 1992, p. 192. Nasser's speech on the anniversary of the Egyptian revolution, July 23, 1967, in Walter Laqueur, ed., The Israel-Arab Reader (Harmondsworth: Penguin, 1970), p. 248. The New York Times, May 27, 30, 1967. Ibid., May 27, 1967; Abdel Latif Baghdadi, Mudhakirat (Cairo: al-Maktab al-Misri al-Hadith, 1977), vol. 2, p. 271; al-Usbu (Cairo), Jan. 24, 1976. Nasser's speech to Arab trade unionists, May 26, 1967, in Laqueur, The Israel-Arab Reader, pp. 215-8. Samir A. Mutawi, Jordan in the 1967 War (Cambridge: Cambridge University Press, 1987), pp. 11-2; Moshe Dayan, Story of My Life (London: Sphere Books, 1978), p. 314. Rikhye, The Sinai Blunder, p. 21; Baghdad radio, June 1, 1967. See, for example, Nasser's speech, July 23, 1967; Robert Stephens, Nasser: A Political Biography (London: Allen Lane, 1971), p. 489.
. "Milhemet Arbaat Hayamim, 1967" (an internal IDF document based inter alia on intercepted Egyptian intelligence sources), June 1967, Israel Defense Forces, Southern Command. The existence of operational plans to occupy Israeli territory was also confirmed by Egyptian military sources. See, for example, Muhammad Abdel Ghani al-Gamasy, Mudhakirat al-Gamasy: Harb October 1973 (Paris: al-Manshurat al-Sharqiya, 1990), pp. 70-1, 73-4. William B. Quandt, "Lyndon Johnson and the June 1967 War: What Color Was the Light?" Middle East Journal, Spring 1992, p. 221, fn. 68. Hussein of Jordan: My "War" with Israel (London: Peter Owen, 1969), p. 55; Mutawi, Jordan in the 1967 War, p.110; Sadat, In Search of Identity, p. 174; Heikal, 1967: al-Infijar, pp. 1062-3. Mahmoud Riad, The Struggle for Peace in the Middle East (London: Quartet Books, 1981), p. 23. See, for example, David Hirst, The Gun and the Olive Branch: The Roots of Violence in the Middle East (London: Faber and Faber, 1977), p. 211; Col. Trevor N. Dupuy, Elusive Victory: The Arab-Israeli Wars, 1947-1974 (New York: Harper and Row, 1978), p. 229; Donald Neff, Warriors for Jerusalem: The Six Days that Changed the Middle East (New York: Linden Press, 1984), p. 196; Michael Oren, Six Days of War: June 1967 and the Making of the Modern Middle East (New York: Random House, 2003), pp. 58-9; Frank Brenchley, Britain, the Six-Day War and Its Aftermath (London: I.B. Tauris, 2005), p. 17; Henry Laurens, "1967: A war of miscalculation and misjudgment," Le Monde Diplomatique, June 2007. Parker, The Politics of Miscalculation in the Middle East, pp. 97-8. Related Topics: Arab-Israel conflict & diplomacy, Egypt, History, Israel & Zionism | Efraim Karsh | Summer 2017 MEQ receive the latest by email: subscribe to the free mef mailing list This text may be reposted or forwarded so long as it is presented as an integral whole with complete and accurate information provided about its author, date, place of publication, and original URL.